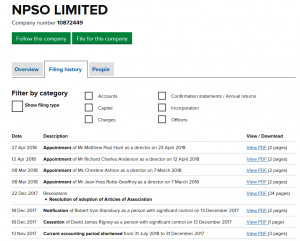 There already was an NPSO Ltd – a company limited by guarantee no. 10872449 founded on 18th June 2017 and also registered to 2 Thomas More Square, London. Company no. 10872449 has made numerous filings and now terms itself the UK’s leading authority on retail payments. Company no. 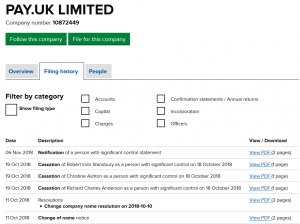 10872449 changed its name on 10th October 2018 as well – to Pay.uk Ltd. The two companies executed a “name swap”. An asset swap, a house swap, a currency swap are known quantities, but a name swap? Company no. 11536594 has only ever had one member – a Mr Paul Edward Horlock, who turns out to be CEO and a Board Member of company no. 10872449 and is the one and only person with significant, or any, control over company no. 11536594. A Company limited by guarantee has no shares, and until it has more than 4 members, all its members must be identified as persons with significant control at Companies House, the threshold being 25%. The measure of any one member’s control is simply 100% divided by the number of members or “guarantors” (the two terms being interchangeable in this context). Company no. 11536594 (the one now called NPSO Ltd) apparently has no payment system to operate – an old one or a new one – and never will, and is just a shell company. Its ostensible purpose was to reserve the name Pay.uk Ltd in between August and October 2018. Usage of shell companies – ones with no trade and set up for some tax, legal or regulatory purpose only – is being clamped down upon in the EU’s 5th Anti-Money Laundering Directive, but this does not seem to have been a deterrent here: oh no! We have two more recently-formed companies limited by guarantee, both at 2 Thomas More Square, and both with just one member – the same Mr Paul Horlock. There is company no. 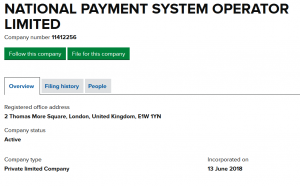 11412256 “National Payment System Operator Ltd” – founded on 13th June 2018, and company no. 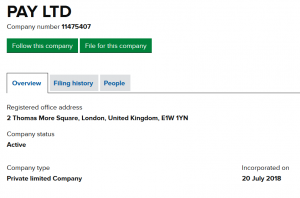 11475407 – “Pay Ltd” – founded on 20th July 2018. No further filings have been made by either. Neither appears to have a payment system to operate – national, regional or local, old or new. These are two more shell companies and with absolutely no apparent purpose. What on earth is going on? Company no. 10872449 (the one founded as NPSO Ltd and now called Pay.uk Ltd – are you following this? Well pay attention, then) began with a single member (Melanie Johnson), and the identity of the single member altered twice (to Karen Jane Milton and then to David Rigney) before becoming Robert Stansbury on 18th December 2017. This member has remained in place, and was joined by two more (Richard Anderson and Christine Ashton) on 2nd May 2018, with all three identified as a “person with significant control” at Companies House, that is until recently. As of 18th October 2018 company no. 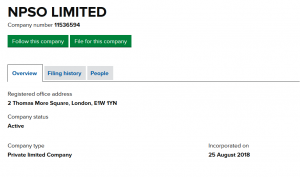 10872449 – taking on the name of Pay.uk Ltd on the same day – made a further filing that these three persons had ceased to have significant control. Indeed, the company’s minutes of its Board Meeting on 10th October 2018 point 196 confirm that these three persons would withdraw “as Interim Guarantors of the Company with effect from the date of entry of the new guarantors in the Company’s statutory register”: nb the terms “guarantor” and “member” are interchangeable. At least five new persons must have waiting been in the wings stage right, such that the existing three members could exit stage left, leaving Pay.uk Ltd onstage with sufficient new members that none would have “significant control”. To date – close of business on Friday 23rd November 2018 – no further filings of members have been made. This is curious again, since the company CEO announced at a public event on 18th October 2018 verbally that 50+ new members would be joining. The 10th October Board Minutes, however, state a lower number: “Following the change of name, the Board noted that applications to become a guarantor of the Company had been received from 30 organisations, as detailed in the Board papers”. Were 20+ further applications received after 10th October but in time to have been approved by 18th October? It does not say much for the depth of the approval process if 20+ applications could be turned around, positively, and inside a week, but then we learn that “After due consideration, the Board approved the applications” that had been received by 10th October, all 30 of them, without exception, and under one point on a full agenda. It must have been a very long Board Meeting if the Board really did give “due consideration” to each of these 30 applications. An application for membership of IBOS Association, by way of example – and this would surely be regarded as completely normal – would have been considered at a similar type of meeting, and required a presentation by the applicant of their reasons for applying to join (30 minutes plus 15 for questions), a presentation by the IBOS secretariat of the business case for the new member joining and any problematical issues it might throw up (same time slot), and then a discussion in private by the existing members (30 minutes) – a minimum of 2 hours per applicant would have been set aside so that due consideration could be given. 30 applicants – 60 hours – 8 working days as a minimum. We even had a case in IBOS where the meeting was on the Saturday before SIBOS in October and the discussion was prolonged – until the lights in the hosting bank’s building went out on an automatic switch, we had to hold the vote in semi-darkness by open outcry like a séance (“Martin, are you there?” “Yes I am”. “Do you agree to the application?” “Yes I do”. “Now Giorgio”. “Yes, I’m here” “Do you…”, and so on, 14 times), and then fumble our way to the stairwell. Pay.uk’s Board process sounds like a rubber-stamping job as there is no evidence that any one application was discussed individually and to the level needed when the selection was of institutions who would collectively control 100% of the UK’s main retail payment systems. It is indicative that not a single application was rejected. Does anyone remember the advertisement “It’s the fish that John West reject that makes John West the best”? Not here, it isn’t. What were the criteria for an institution to be granted a degree of control over a national asset, and for no consideration in either cash or kind? Who is setting down the principles around this and other matters, and recommending that things be done in this way? Surely it would have been possible for company no. 10872449 to have changed its name from NPSO Ltd to Pay.uk Ltd without having company no. 11536594 (or others) founded. There must be some other way of keeping a new name under wraps for two months. Indeed, if the name Pay.uk was an asset of national importance, a better way should have been found than setting up a shell company owned by one private individual, and a senior executive and director of NPSO Ltd at that. One cannot suppress a sense of similarity with manoeuvres commonly attributed to the double-glazing business, where Company A (e.g. Peckham & Byzantium Windows Ltd) has an order book, cash, debtors, stocks and creditors, and Company B is set up by the same principals but as Peckham & Byzantium Windows Services Ltd. Over a weekend Company A transfers the assets to Company B for a consideration of £10 while Company A retains the creditors (trade creditors, VAT, Inland Revenue). This particular type of “asset swap” has the outcome that Company A is put into administration on Monday morning, leaving the debts unpaid and with no assets to be realised to pay them. Company B carries on with the business, now debt-free. We have come across no evidence that the manoeuvres of NPSO and Pay.uk have any motive other than the change-of-name, but Pay.uk’s proceedings themselves are byzantine, and engender a queasy feeling that generally accepted principles of good governance are not being followed. This feeling is exacerbated by the existence – to no apparent purpose at all – of company no. 11412256 “National Payment System Operator Ltd” and of company no. 11475407 “Pay Ltd”. Since 18th October, Pay.uk Ltd has been out-of-compliance with Companies House record-keeping conventions because only three members are registered and none is said to have significant control: this cannot be true of a company limited by guarantee. They remain registered as members when the company’s Board Minutes imply both that they have stepped down, and that new members – of which there must be at least five, could be exactly thirty, and might conceivably be over fifty – have been approved. None of these new members are identified, however. This, though, is just the deviation most recently coming to light. Having one, then three, private individuals as Pay.uk’s members was the first deviation when Pay.uk’s Articles of Association are clear in their implication that all its members be bodies corporate, and not natural legal persons. The second was that all members have at the same time been Board Directors, a conflict of interest. The third was transferring into Pay.uk the ownership of the scheme companies for BACS, Faster Payments and Cheque&Credit before a properly-vetted, new set of members had joined. The fourth was the founding of three shell companies with no trade – company no. 11536954, no. 11412256 and no. 11475407 – and each with a sole member who was also a director of company no. 10872449. Their continued existence is a fifth deviation: 11536954 should have been struck off the register immediately after its change-of-name, and 11412256 and 11475407 should have been struck off as soon as their purposelessness was identified, or not founded at all. The sixth deviation is the process for vetting new members before they are recommended to the Board – since all get through – and the seventh is the definition of what constitutes “due consideration” of a membership application in the Board. Pay.uk now controls assets of national importance but its proceedings smack of Trotters Independent Trading Company (of Peckham – chandeliers and other glazing work a speciality).